I missed last month's crawl but I made this month. 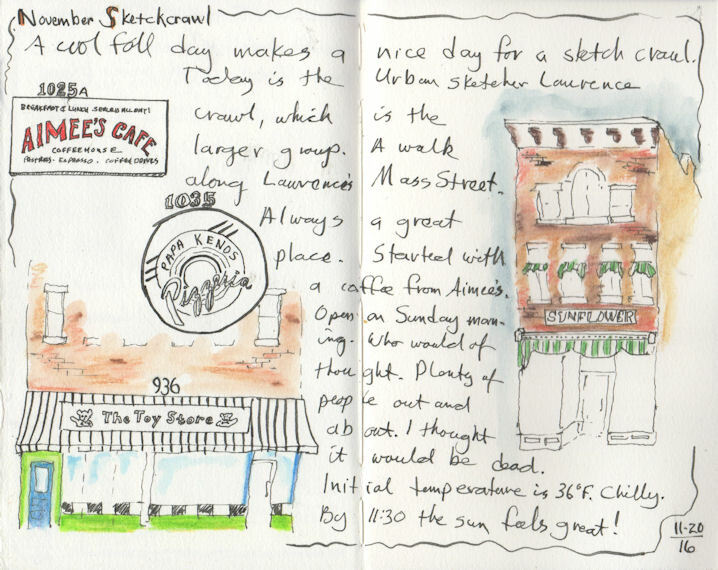 This time we tagged along with the official Urban Sketchers Lawrence group. 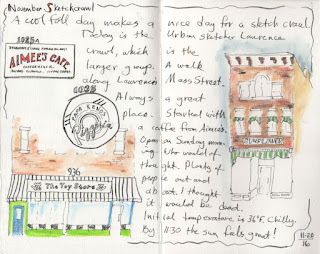 We sketched along Mass Street on a cold Sunday morning. I loved it out in the cold knowing it would warm up soon. The sun was out, too, which makes an emotional difference. The amount of people along Mass Street surprised me! I had no idea they had commerce going at that hour. Luckily I could buy some coffee. I had my thermos ready but I won't pass up a chance to give some business to a coffee retailer. Only one strange character approached me. He told me I had a good seat (my 3-legged stool on the sidewalk) and then pointed to a woman friend approaching and told me that was Jesus. Oh well, he didn't ask for money. Wilma took the time to do some reading in the warm car as I sketched in the cold. The plan was to meet up at a local bar & grill at noon to eat and chat. I'm not sure what the disconnect was but they were not welcoming. Maybe they are a closed group. They only use Facebook and I don't have an account there so I don't know how they run their show. I'm just used to these things being open and friendly. Anyway, Wilma and I decided to eat at our own table and we had a nice outing by ourselves. We like coming to Lawrence to spend time. Topeka is closer but not by much. Lawrence has the atmosphere advantage of being smaller and having a major university.